In an effort to protect its marine environment, Hawaii becomes the first state in the nation to ban synthetic sunscreen that is harmful to the coral reefs. The law specifically prohibits the sale and distribution of sunscreen containing oxybenzone and octinoxate, which will take effect in 2021. The two additives included in the ban—oxybenzone and octinoxate—are said to cause, “mortality in developing coral; increase coral bleaching that indicates extreme stress, even at temperatures below 87.8 degrees Fahrenheit; and cause genetic damage to coral and other marine organisms.” A study published in the journal Archives of Environmental Contamination and Toxicology from 2015, found that 14,000 tons of sunscreen end up in and around coral reefs each year in Hawaii and in the Caribbean. Sunscreens containing oxybenzone and octinoxate are known as synthetic sunscreens and soak into the top layers of our skin. Synthetic sunscreens protect us by absorbing UV rays, and then converting them into infrared rays. While they make up a large portion of sunscreens on the market due to their more cost effective price point they are not the only options available. Sunscreens containing titanium dioxide and zinc oxide are known as mineral sunscreen and are not affected by Hawaii’s recent legislation. It works by forming a protective layer on the skin and physically reflecting UV rays. “All sunscreens, including chemical sunscreens, have safe ingredients that have not been scientifically proven to be toxic or hazardous to humans. The effect of chemical sunscreens on the coral reef does warrant more research and exploring other options when traveling. Mineral sunscreens are the types of sunscreen I recommend anyway, so it does not make a really significant change in my opinion, “ said Smith. 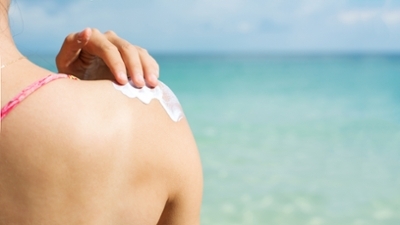 Most dermatologist would agree that the best sunscreen is the one that you will use. Both types of sunscreens are effective and it all comes down to your circumstance and situation. What matters most in ensuring broad-spectrum protection from UVA and UVB rays, and diligently using whatever type you choose. The American Academy of Dermatology Association has expressed concern that the restrictions could lead to an increase in skin cancer, particularly melanoma, which the organization says is already 30% higher in Hawaii than the national average. Nevertheless, doctors see this as an opportunity to increase their efforts in educating the public on the importance of sun protection. “When visiting Hawaii consider investing in a mineral sunscreen or if all else fails use additional sun safety practices such as seeking shade, wearing protective clothing, and limiting time in the sun between 10am and 4pm,” said Smith. As far as sunscreen usage in Utah no changes need to be made. Continue to wear SPF 30 sunscreen of any brand and type, reapply every 1-2 hours, and remain aware of how much time you are spending in the sun.